It is no longer accurate to call Elvis Costello a rock star. Rather, he is a professional omnivore—a master, for better and worse, of eclecticism. Costello presents himself as much as a fan as a participant, and his participation is relentless. He has evolved into one of the most spirited accomplices in tribute gigs, variety evenings, and extracurricular combinations. This according to “Brilliant mistakes: Elvis Costello’s boundless career” by Nick Paumgarten (The New Yorker LXXXVI/35 [8 November 2010] pp. 48–59. Today is Costello’s 60th birthday! 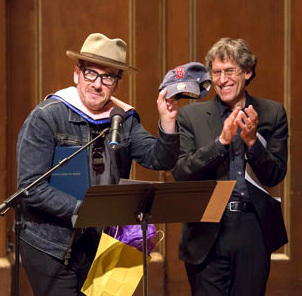 Above, receiving an honorary doctorate and some Red Sox memorabilia at New England Conservatory in 2013; below, at the Montreal Jazz Festival in 2006. BONUS: Back in the day. I’ve been a lifelong fan, but have not enjoyed his recent albums. Thanks. In some ways he’s more interesting as a pathfinder and teacher than an artist in his own right! Regards Thom.